Who invented the Crossword? The name of the person credited with inventing the Crossword, one of the most popular word games in the world, is Arthur Wynne (1871 - 1945). Arthur Wynne is not only famous as the English-American inventor of the Crossword but also as a journalist. When was the Crossword invented? Arthur Wynne invented the Crossword in 1913, during the WW1 period of invention. 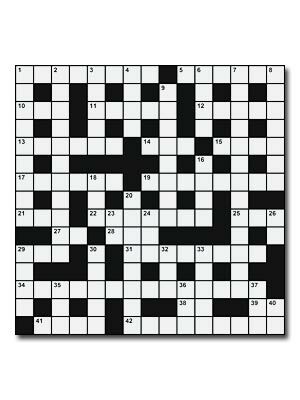 Definition of the Crossword: The Crossword is defined as a puzzle in an arrangement or grid of numbered squares which is filled with answers to clues. The one word answers to the clues are written in to squares in the puzzle, both across and down the grid, to correspondingly numbered clues. Crossword Puzzle styles and options include Criss-Cross, Standard American and Cryptic. Fact 1: Who invented the Crossword? The Crossword was invented by Arthur Wynne in 1913 during the WW1 era of inventions. Fact 2: Who invented the Crossword? Prior to the invention of the Crossword in 1913, there were various forms of word games such a puzzle called "Word Squares". Arthur Wynne was inspired to create a new word puzzle similar to his childhood favorite called "The Magic Squares". Fact 3: Who invented the Crossword? The first crossword puzzle was actually called a "wordcross". Fact 4: Who invented the Crossword? The inventor of the Crossword, Arthur Wynne, was born on June 22, 1871 in Liverpool, England and died on January 14, 1945 in the United States. Fact 5: Who invented the Crossword? The early years of Arthur Wynne were spent in Liverpool, England where he was raised by his family. Arthur Wynne received a good but basic education and did not undertake higher education at a University. He loved music and was a talented violin player. Fact 6: Who invented the Crossword? Arthur Wynne emigrated to the United States on June 6, 1891, at the age of 19 and started his new life in Pittsburgh, Pennsylvania. Fact 7: Who invented the Crossword? His first job in America was on the Pittsburgh Press newspaper where he trained as a journalist. He loved his new life in America and was invited to play the violin in the Pittsburgh Symphony Orchestra. Fact 8: Who invented the Crossword? Arthur Wynne, having gained experience as a journalist with a provincial newspaper applied and succeeded in getting a job as a journalist and contributor with the New York World, a newspaper published in New York City. Fact 9: Who invented the Crossword? The New York World was known for its outstanding reporters, columnists, editors and cartoonists and made every effort to boost its circulation and widen its appeal to its readers. They included Funny Pages and a Magazine to give some light relief to their news stories. Fact 10: Who invented the Crossword? Arthur Wynne was asked to create a series of word games and puzzles for the "Fun" section of the Sunday edition of the newspaper, that would appeal to both its male and female readers. Remembering his favorite word puzzle of "The Magic Squares" Arthur Wynne went on to create "Word-Cross" as one of the puzzles. Fact 11: Who invented the Crossword? "Word-Cross" began in a diamond shaped grid and had inter-connected words with "across" and "down" clues. The letters F-U-N were already filled in as the starting point. At this point the puzzle did not contain any black squares. Fact 12: Who invented the Crossword? The first "Word-Cross" was published on December 21st, 1913 and proved to be extremely popular with readers of the newspaper and became a regular feature of the Sunday edition. Fact 13: Who invented the Crossword? Arthur Wynne wanted to keep his "Fun" section fresh and began to introduce some new ideas and innovations use of horizontal and vertical lines to create boxes for readers to enter letters to solve the puzzle. Fact 14: Who invented the Crossword? He then went on to use of black squares in a symmetrical arrangement to separate words in rows and columns which has become the distinguishing feature of this popular word puzzle. Fact 15: Who invented the Crossword? Arthur Wynne continued to call his puzzle "Word-Cross" but its name changed to 'Crossword' in January 1914 as the result of a typing error, and the new name for the puzzle stuck. Fact 16: Who invented the Crossword? Arthur Wynne continued to improve his puzzle and the game evolved into the square or rectangular-shaped "crosswords" with black squares that we know today. Fact 17: Who invented the Crossword? Arthur Wynne married Alice Harkness James and the couple went on to have a daughter they named Joyce Edna Wynne in 1917 who they raised in Cedar Grove, New Jersey. Arthur Wynne became a naturalized US citizen in the 1920s. Fact 18: Who invented the Crossword? Crosswords first appeared in Britain in February 1922 in a monthly periodical called "Pearsons Magazine". Fact 19: Who invented the Crossword? The Sunday Express was the first British newspaper to publish a crossword, from an adapted Arthur Wynne puzzle, on November 2nd, 1924. Fact 20: Who invented the Crossword? The popularity of the Crossword resulted in Arthur Wynne publishing the first crossword book in 1924. Fact 21: Who invented the Crossword? The Daily Telegraph’s cryptic crossword published on January 13 1942 played a crucial role in recruiting men and women to work at Bletchley Park during WW2 (1939 - 1945). These brilliant people went on to solve the apparently unbreakable Enigma machine code as can be seen in 'The Imitation Game' 2014 movie starring Benedict Cumberbatch as Alan Turing. Fact 22: Who invented the Crossword? Arthur Wynne died in Clearwater, Florida, on January 14, 1945 but will always be remembered as the inventor of the Crossword Puzzle. Fact 23: Who invented the Crossword? Research has shown that completing Crossword Puzzles is beneficial to our health by improving the overall brain and memory function and may help to ward off Alzheimer's Disease and Dementia. Who Invented the Crossword - Arthur Wynne - Inventor - Invention - Definition - Meaning - Famous - Important - History - Timeline - Innovation - Significant - Development - Toys and Games - First - Definition - Kids - Facts - Information - Info - Who invented Crosswords - Dates - When - Why - Impact - Purpose - Use - New - Old - Amazing - Best - Definition - Meaning - Awesome - Cool - WW1 - English-American - History - Timeline - Who invented Crosswords?